Lead singer, keyboardist, and songwriter of Gram Rabbit, Jesika von Rabbit has released her new video, “Psychic Spice”, which is also a track from her upcoming solo album titled “Journey Mitchell”. The album reflects a shift in energy for von Rabbit now that Gram Rabbit are on a sabbatical of undetermined length. For her new project which was entirely written and recorded on her own, von Rabbit is extending the electronic element of Gram Rabbit with “Adult Theme-Park Pop”. Jesika von Rabbit will be performing on Valentine’s Day, opening for Dengue Fever at her favorite cosmic honky-tonk, Pappy and Harriet’s, which features a menu item called “Nachos von Rabbit”, created by, and named after her. Closed Friday, Sunday, Major Holidays and periods of University closure. Parking on weekends is free starting at 5 p.m. Friday. 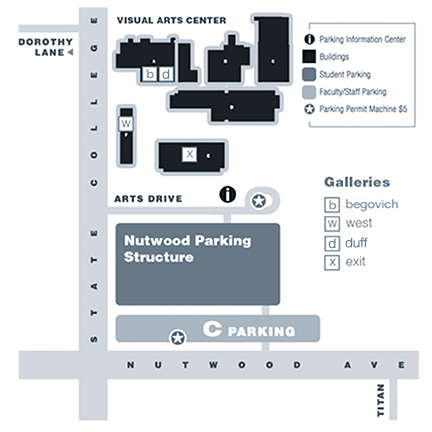 At other times, daily permits are $8 and can be purchased upon entering the parking structure/lots. This exhibition presents about twenty-five whirligigs on psychological themes, carved in wood and painted by Peter Gelker. A breeze blows, a wheel turns, a soldier springs to life and spears a giant spider. Such fanciful woodcarvings are in the American Folk Art tradition of whirligigs, which is continued today by Peter Gelker in his twirling figures in the throws of myths, dreams, and nightmares. Gelker was introduced to whirligigs by his father, a machinist who learned to carve growing up in the Depression-era Midwest near the Ozarks. Gelker left rural life and manual labor for an academic life in California, where he enrolled in medical school and studied psychiatry. But his rural roots kept sprouting and flowering in his passion for crafting metaphors for the human mind—and its neurological substrate—which he encountered on his day-job. Thus Gelker senior passed a Folk Art tradition on to his son, who makes serious toys for a mad-cap world. Whirligigs have a place in the history of psychiatry, in which Gelker holds an M.D., and psychoanalysis, in which he is certified. Sigmund Freud recognized that people use jokes to inflict pain (he collected “Jewish jokes”), but Freud also stressed the healing power of humor (The Joke and its Relation to the Unconscious, 1905). While being careful not to trivialize suffering, the creator of a comic antic encourages us to not take our troubles too seriously, makes us laugh, and helps us to see through to a brighter day. The role of toys and games in child development began being studied in the 1930s-40s by the Austrian analyst Melanie Klein, and after World War II, her student, the British pediatrician Donald Winnicott, expanded her work to include toys for adults (sports cars, designer clothes), in so-called object relations psychotherapy. Following this lead, today mental health professionals ask: Why do we collect certain objects? How do games of make-believe help us navigate our way through the labyrinth of life? Why do so many people find comfort in Folk Art? Why do Peter Gelker’s whirligigs make us smile? Catalogue: about 100 pages, hardcover with dust jacket, including a CD (of the whirligigs in motion) in a sleeve inside the back cover. Edited by Lynn Gamwell. Essays by Simon Bronner and Lynn Gamwell. Simon Bronner Ph.D. specializes in so-called “psychological ethnology”—the study of the human emotions, perceptions, and motivations that underlie the creations of Folk Art. A graduate of the Folklore Institute of Indiana University and currently Distinguished Professor of American Studies at Penn State Harrisburg, he is author of The Carver’s Art: Crafting Meaning from Wood (University Press of Kentucky, 1996), a study of four elder woodcarvers in rural Indiana. In this landmark study, Bronner focused on the psychological meaning of woodcarving within the cultural context of the Midwest and the individual lives of these men. In 2011 Bronner was named editor of the leading reference work on American Folklore, the Encyclopedia of American Studies. Free parking in the Pickwick Bowl lot. Friday, January 9 marks LoveyDove‘s first show of 2015 at Viva Cantina, located across from Pickwick Bowl in Burbank, with the fabulously outrageous Gluey Brothers. LoveyDove are one of SoCal’s choicest purveyors of pop since 2013. Dan West & Azalia Snail are mainstays in the underground world of indie rock rising to new heights with their LoveyDove union. Their debut album was called irresistible by the LA Weekly. Their song “Less is Never More” is featured in the Sony feature Space Station 76. Their next album ShowStopper is due in Spring 2015. The Gluey Brothers have been entertaining audiences nationwide with their unique and wacky sounds for over 15 years. Opening the night is comedian Pete Handelman, who has starred in Whitefire Theatre Hollywood Shorts.